TO BE SURE - LOOK FOR THE - IT’S A TRADEMARK SYMBOL. 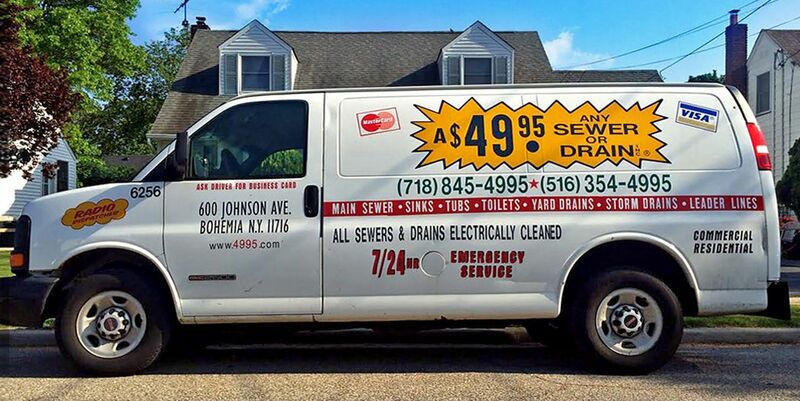 "IF YOU DIDN'T CALL US, YOU PAID TOO MUCH"
WELCOME TO A $ 49.95 ANY SEWER OR DRAIN, INC.
A $49.95 Any Sewer or Drain is a leading provider of sewer and drain cleaning services in Brooklyn, Queens, Bronx, Nassau and Suffolk counties. For the over 15 years we have been servicing our loyal repeat customers and each day our data base grows with new customers. Customers are our top priority. To make your experience with our call center painless, our call center is staffed by courteous, friendly, knowledgeable and professional people. With a fleet of trucks ready to serve you, the solution to your sewer and drain needs is only a phone call away. We are available 24 hours a day, 7 days a week and there are no extra charges for nights, weekends or holidays. Our technicians are experienced and trained to handle any sewer or drain emergency problem providing you with an experience that will encourage you to return. We are the original company that started the low price trend. Don't be fooled by imitators. Sewer stoppages are very common due to multiple reasons. Main Sewer line in your house or building carry all the waste water from the house out to the main city sewer. The volume of waste water that goes through the sewer line builds up clogs in the main sewer line. The clog is usually built up due to soap deposits. Another major factor in sewer back up is the fact that tree roots make their way into the sewer line via the joints in the sewer line and clog the sewer line. To prevent tree roots from damaging your sewer line, it is important to have the main sewer cleaned once a year as a precautionay measure. We offer main sewer cleaning contracts that save you 50% off your main sewer cleaning.